The Stable Table is purposebuilt to be the finest valuepriced shooting bench in the market. Its design is more rigid and has fewer joints than foldingstyle benches and is appropriate for a wider variety of shooting conditions and disciplines. A bolt in the base allows position adjustment of a single leg aligning the tabletop so that it is parallel with the horizon. The central shaft seat and tabletop are able to pivot around a center axis as a single unit while keeping the tabletop parallel to the horizon. This allow the user to make shots at any angle from a single setup ideal for varmint hunting. The bench can easily be locked into a single shooting position if desired. Its table top is made from molded plastic with a rigid metal underframe. The top measures 34 x 23" and it includes holes that function as handles for easy transport or as holders for the included cleaning forks as well as a perimeter rail that keeps ammunition from rolling off the bench top. The entire frame is made from welded steel. 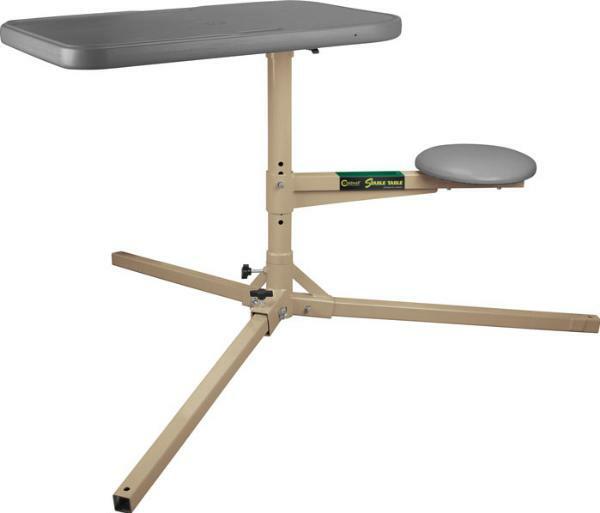 The padded seat adjusts from 16" to 22" and rotates in tandem with the tabletop."